Not bad for McLaren's first grand tourer. As McLaren continues to mature as a purveyor of four-wheeled fun, the next natural step in its evolution is to make a comfortable cruiser that its older retired fans can use while going on road trips. It’s already got a hypercar, the P1, a supercar with the 720S, a super sports car (that’s more supercar than sports car) in the 570S, and now this: a Porsche 911 Turbo fighter with the 570GT. But how does McLaren's first grand tourer stack up against the Stuttgart legend? Chris Harris, lucky man that he is, gets under the glass roof the the newly released MaCa to see how it stacks up against both its own sibling and other cars in the segment. 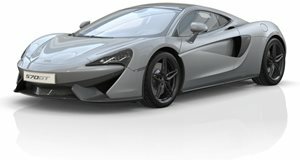 According to him, the 570GT is McLaren’s way of showing it has a funny bone in its body despite adding practicality. And though it might be slower at the end of a hot lap than its bigger brother, the 570S, it never once looks like Harris is having any less fun. However, it takes a trip to the mountain road to test a grand tourer to see how the softer suspension and reduced grip work here. While there’s no doubt that McLaren can find a way to make a car that’s a superb mountain climber, the company’s traditionally spartan cabins might prove to dock it in the comfort and convenience segment—an important area for GT cars. Added leather, sound deadening, softer Pirelli P-Zeros, and a glass hatch to compliment the roof all work together to change the character of the McLaren while keeping it on par—at least in terms of speed and cornering—with the Porsche 911 Turbo.